10 February 2010, at 12:34p.m. AUSTRALIA - A multi-pronged approach to reducing Campylobacter numbers in broiler flocks is part of the new Poultry CRC's strategy on food safety. Food safety and, increasingly, food security, are two big ticket items the poultry industry must face. For the chicken meat industry, the biggest food safety issue is food poisoning caused by the pathogenic bacteria Campylobacter jejuni and C. coli. Although hygienically handled and cooked chicken presents no problem, not everyone manages to achieve this every time in their kitchen. In an attempt to reduce the risk posed by Campylobacter, the chicken meat industry has sought to eradicate it from the food chain. 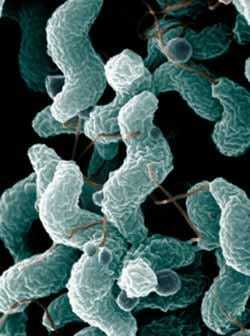 The difficulty is that Campylobacter do not cause disease in chickens. To solve this problem, which has vexed researchers for decades, the Poultry CRC, in its second term, will adopt a multi-pronged approach to reducing Campylobacter numbers in flocks, thus reducing the numbers available to contaminate meat and cause disease. Sub-projects will include the development of rapid detection tests (replacing slower conventional tests), vaccines, novel feed compounds with anti-Campylobacter properties and techniques to modify the gut microflora to competitively exclude Campylobacter. Lloyd Thomson, the CRC's Commercial Manager, explained: "In a similar way to how occupational health and safety programs seek to reduce the total number of accidents to reduce the total number of deaths, we will seek to reduce the total number of Campylobacter bacteria and, therefore, the number of cases of bacterial food-borne sickness." Food security will mean more to everyone in the coming decades as the planet’s population rapidly expands. By 2050, an Australian population heading towards 40 million will need cheap, high quality, low fat protein, which chicken meat and eggs can supply. Mr Thomson added: "In a post-modern, greenhouse gas threatened world, we simply cannot do more of the same. We have to produce more chickens and eggs, with less environmental impact in a welfare-friendly way without forgetting to keep an eye on food safety. For these reasons, Poultry CRC2 will focus on using diet to reduce greenhouse gas emissions, improve carbon retention in litter, mitigate waste streams through new value-adding and reuse technologies, reduce overall feed use through improved utilisation of feed by the birds, and adopt an evidence-based platform to implement best practice husbandry across industry. "It's no longer enough to produce great chicken at a low price. Now we need to produce twice as much with less resources and waste, and continue to do so humanely."